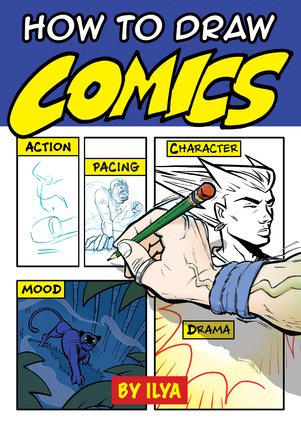 With step-by-step instructions, drawings to complete, and space to experiment, How to Draw Comics is for anyone interested in creating your own cartoon, graphic novel, or manga. Ilya helps you develop your own style as you learn about the principles and practice the techniques involved. Fun and interactive, with captions, speech balloons, and sound effects bursting out of every page, the book looks just like a comic book, but with the widest variety of styles imaginable. Ilya covers the basics of drawing faces, figures, and motion; using color; comic timing; creating cliffhangers and suspense; and how to create action in the blank space between panels—and therefore in the reader's mind. Perfect for comics enthusiasts and artists from ages 8 to 80, How to Draw Comics is the ultimate guide to cultivating your talent and mastering the art.With step-by-step instructions, drawings to complete, and space to experiment, How to Draw Comics is for anyone interested in creating your own cartoon, graphic novel, or manga. Ilya helps you develop your own style as you learn about the principles and practice the techniques involved. Fun and interactive, with captions, speech balloons, and sound effects bursting out of every page, the book looks just like a comic book, but with the widest variety of styles imaginable. Ilya covers the basics of drawing faces, figures, and motion; using color; comic timing; creating cliffhangers and suspense; and how to create action in the blank space between panels—and therefore in the reader's mind. Perfect for comics enthusiasts and artists from ages 8 to 80, How to Draw Comics is the ultimate guide to cultivating your talent and mastering the art. Ilya draws on more than thirty years' experience as a comics writer, artist, and editor. His works have been published by Marvel, DC, Image, Kodansha, and others. His books include Room for Love, Manga Drawing Kit, and a manga adaptation of King Lear.